Red Bud Industries is now offering Automated Cranes for coil storage and retrieval, as well as Slit Coil and Sheet/Blank Storage Systems. These systems will reduce your labor cost, create a safer working environment, and also significantly reduce the footprint of the building. 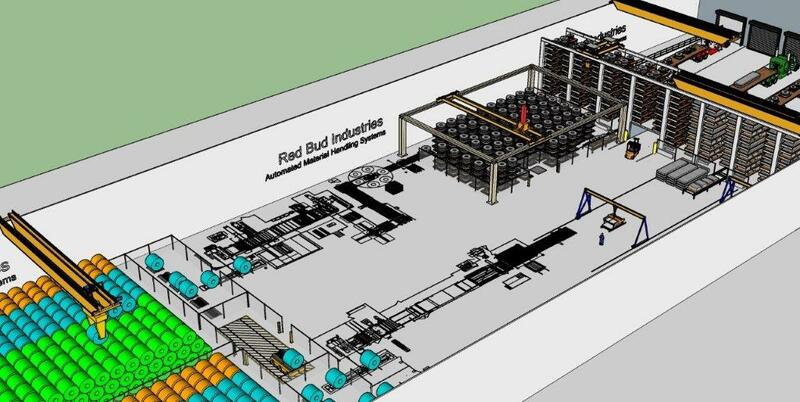 These systems can be integrated with Red Bud Industries’ Coil Processing Equipment to allow for better scheduling and improved productivity. Red Bud Industries offers a fully automated Coil Prestage & Load System for their Heavy Gage Coil Processing Lines. This system automatically advances prestaged coils and loads them onto a Dual Stub Uncoiler. The advanced system is comprised of an in-line Coil Prestaging System, integrated Coil Car, and Dual Stub Uncoiler. These components operate in concert to eliminate the need for operator attention or intervention when loading coils. 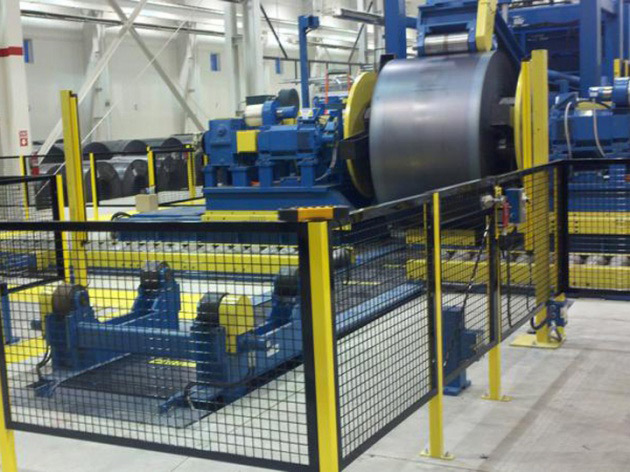 With the push of one button, the Coil Prestage & Load System’s integrated Coil Car retrieves the coil to be processed. The system will then measure the outside and inside diameters of the coil. After measuring, the Coil Car will position and raise the coil as required automatically for loading onto the line’s Uncoiler. The Dual Mandrel Uncoiler will then spear the coil and center it automatically on the line. This sequence of events takes place unattended by the line’s operator. The Coil Prestage & Load System can also incorporate a Coil Reject Station. Unlike traditional In-Line Coil Prestaging Systems which have no means of their own to change the sequence in which coils are to be processed, this supplementary coil staging area allows the process order of the coils to be changed when required. It also allows for partially processed coils to be removed and stored offline eliminating the need for an overhead crane to remove a coil before the next coil can be processed. This allows for quick changeover to the next coil to be processed. Red Bud Industries offers a Rotating Brush Dust Collection System. 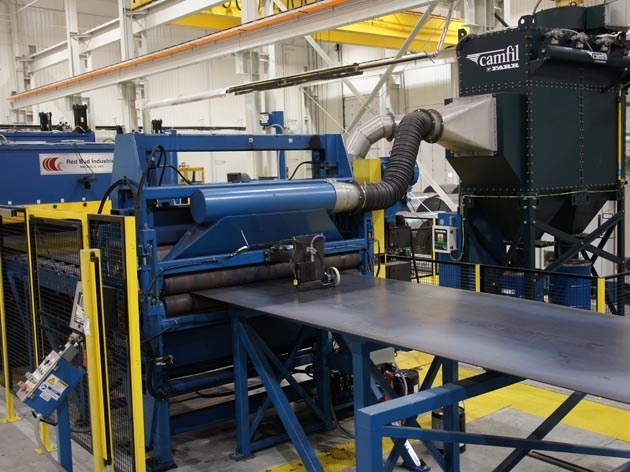 In the past, many companies have offered a variety of vacuum systems to remove both scale and hot roll dust from the surface of the strip as it is processed in a Coil Line. These basic vacuum systems relied on the power of the vacuum alone to remove the dust and debris from the material. However, after vacuuming, a significant amount of scale and dust remained on the surface of the material. This is because the debris on your material acts just like the dust on your car. There is a magnetic attraction between the dust and debris and the metal surface. Have you ever noticed how, even at highway speeds, not all the dust is blown off the surface of your car? So too after vacuuming, not all the loose scale and hot roll dust have been removed from your material. To improve the cleaning process, Red Bud Industries has developed a combination Rotating Brush Dust Collection System. This advanced system utilizes a pair of non-marking upper and lower rotating brushes in concert with a vacuum to agitate the surface of the material and remove a much larger amount of dust and debris from both sides of the strip. This will greatly reduce the amount of dust and dirt spread around your Coil Line and your plant. To increase brush life, the upper and lower brushes alternately move from side to side as they rotate so the brush wears more evenly. The Rotating Brush Dust Collection Unit is available on new lines and can also be retrofitted onto existing lines as well. 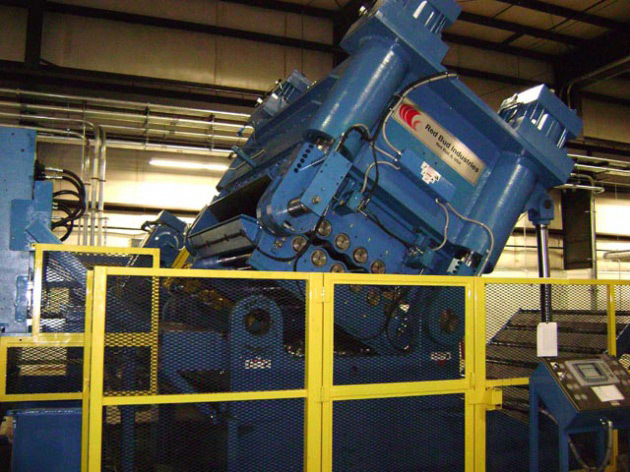 Red Bud Industries offers a Dual Mandrel Turret Recoiler for use in their Coil-To-Coil Slitting Lines. 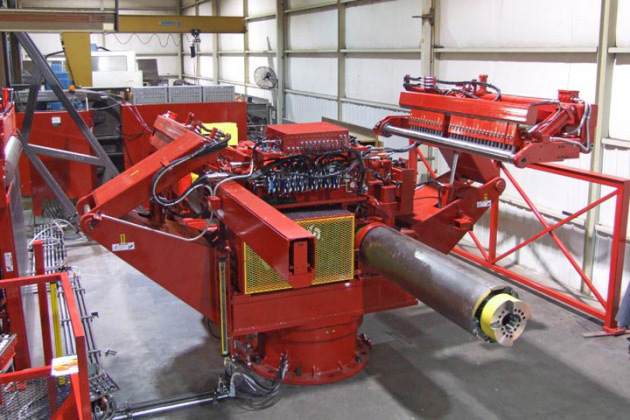 Known for building high capacity process lines that set up and changeover quickly, the Dual Mandrel Turret Recoiler was the next logical improvement to their existing product line. By incorporating two complete mandrels, overarms, and coil pushers on a single swivel base, end users can rotate the Recoiler and restart the line quickly. The previously slit coils are then removed and conveyed to a Packaging System while the line is running. Red Bud Industries expands the capacity of its heavy gage line of equipment by offering a 3/4″ precision backed up Straightener with the unique “pop top” design. This feature allows access to the Straightener work rolls in addition to the work roll back ups. This design is especially well suited to processing hot rolled material where the build up of dust and debris is inherent in the material type. The new Straightener is capable of processing strip up to 3/4″ (19.05 mm) thick by 72″ (1829 mm) wide and 75,000 PSI (517.1 N/mm²) yield.